Nafplio is unlike any other Greek town, ancient or modern. It does not have any ancient archaeological sites with crumbling temples dedicated to mythological gods and goddesses, similar to those found in just about every nook and corner of this ancient country. It is also not home to bland apartment blocks that form endless rows on either side of crisscrossing streets, completely devoid of vegetation, so typical of many of the recently developed Greek towns. Yet, Nafplio has history. It also has beauty and culture. On top of that, some of the views from the town are amongst the most stunning to be found anywhere in Greece. In his youth, Major Habib Ahmed lived in Kapurthala. His father and grandfather were well-known doctors there -- the chowk near their home was named after the grandfather. Habib attended Randhir College, playing tennis and basketball regularly with his friend Rattan Chand Ahluwalia and other young men in town. When he graduated, he found work in Delhi. But Kapurthala, then and for years to come, exerted a magnetic pull. Every weekend, he would jump on his motorbike and tear north through the Punjab plains to see family and keep up with tennis. It was so hard to return to Delhi that Habib would often put off the trip till early Monday morning -- 500 southward km, and by 10am he would be at his desk in Delhi. Not many would know that Athens was not the first capital of Greece -- or modern Greece, to be more precise. I was certainly unaware of that fact when I first arrived in Greece. Athens' name has been virtually synonymous with that of Greece for thousands of years. And to those with more than a fleeting interest in history, the name of Sparta and perhaps Corinth would also ring a bell. But not much else. So it was a surprise for me when informed that the first capital of modern Greece was Nafplio, down south in a region called Peloponnese. I also learnt that Nafplio was a pretty little town, far removed from the smog and traffic jams of Athens, and a popular day trip destination from Athens with unmatched beauty, mild climate and proximity to many important archaeological sites. My first chance to visit Nafplio came when I joined a tourist group for a day trip into that corner of Peloponnese back in early 2008. That trip covered Corinth, Mycenae and Epidaurus besides Nafplio. The packed schedule of the trip meant a halt in Nafplio of around 40 minutes – not even enough to quickly stroll through even a part of the elegant old town with its Venetian and Turkish buildings and mansions and graceful streets overlooked by flower-bedecked balconies. However, what I saw of Nafplio in that short time forced me to return to that little town again to explore further. So since then, I have made a few more trips to Nafplio – that lies in the south-east of Peloponnese less than 150 kilometres from Athens. And, on every occasion, I have been impressed. Not many places in Greece appear to be so welcoming and easygoing and I have at times wondered why King Otto had to take the capital to Athens. But then, if Nafplio had remained the capital of Greece, by now it would probably have lost its charm that presently sets it apart. For record, Nafplio remained the capital of Greece from 1829 to 1834. It was on a mild day in the midst of Christmas holidays in 2009 that I was eventually able to dedicate best part of a day to explore at leisure the fortresses and alleys, the cafes, statues and squares of Nafplio. 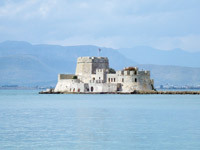 Nafplio boasts of three fortresses in all -- Palamidi, Acronafplio and Bourtzi. Bourtzi lies on an islet in the bay about 600 metres from the mainland and a short boat ride is needed to visit it. Having visited Bourtzi on an earlier visit, my first destination that morning was the Palamidi fortress that is located 700feet above the town and affords stunning views of the Argolic Gulf, the town itself and the picturesque valleys and hills beyond. Built about 300 years ago by the Venetians and regarded as a masterpiece of military architecture, the Palamidi fortress is perhaps the best such structure existing in Greece. Its labyrinthine paths and winding steps hide myriad tales of wars and anarchy, imprisonments and executions. For years, it was home to condemned prisoners, while their executioners, not allowed to live in the town below, were housed in the Bourtzi fort out in the bay. 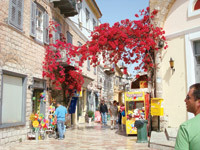 Nafplio has a relaxed and welcoming feel. It hosts a popular music festival each May to welcome the summers. Its residents play host to the countless visitors and foreign tourists who throng this small town's numerous attractions. The visitors and the residents, clad in their traditional dresses, mingle together to create a party atmosphere full of joy and music in the bustling Syntagma Square and the pretty seaside cafes and tavernas. Unsurprisingly, prices in restaurants and tavernas skyrocket as summer approaches, but such unscrupulous acts are to be expected in any major tourist destination and should not overshadow the culture, history and warmth that a tourist experiences on a visit to Nafplio. Be it summer or winter, Nafplio is a postcard setting like no other. In Greek mythology, Nafplio is stated to have been named after Nafplios, son of Poseidon, the god of sea. The town is said to have been inhabited since ancient times, but not much remains now as proof of that. Moreover, for considerable periods in history, the town was overshadowed by a much more powerful city of Argos, that lies just 10 kilometres further inland. In the modern Greek history, however, two names dominate any mention of Nafplio. Theodore Kolokotronis, the general who led the Greek forces in their war of independence against the Ottomans in the early 1820s is one. His statue, appropriately facing the Palamidi, adorns the square that separates the old town from the new. Despite leading the Greeks to freedom, he was for some time incarcerated in the Palamidi fortress itself on charges of treason. He was even condemned to death in 1834 but was pardoned a year later. Some guide books on the town indicate him to have been imprisoned in the Miltiades Bastion of the fortress which was used to house condemned prisoners for around 80 years well into the first half of the 20th century. That may also have been true, but as I traversed the winding paths within the fortress, I followed the fading signposts stating "To Kolokotronis Prison" to the Aghios Andreas Bastion and climbed the stone steps by the side of the Church of Aghios Andreas. A low (not higher than 3 feet), narrow opening in the solid stonewall led into a dark rectangular chamber. 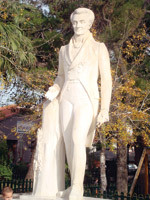 The second name that crops up with the mention of Nafplio is that of Ioannis Kapodistrias – the first head of state of modern Greece, after whom the University of Athens has been named. Although initially a Greek diplomat in the Russian Empire, he retired to Geneva from where he provided material and moral support to the Greek efforts for independence from the Ottoman rule. He himself set foot on the mainland of his own country for the first time in 1828 at Nafplio after having been elected the first head of state of the newly freed country by the Greek National Assembly. He is stated to have made efforts to quickly establish the new country, founding schools and establishing foundations and institutes, but other accounts suggest that his rule eventually became despotic. It was perhaps because of that that he was shot and killed by local warlords in 1831 at the entrance of the Church of Aghios Spyridon right in the middle of the old town. Having descended from the heights of Palamidi, I walked past the glistening white statue of Kapodistrias that faces the old town on to the Church of Aghios Spyridon to see for myself the mark of the bullet, just next to the church's main wooden door, that killed Kapodistrias. An inscription in a somewhat familiar language on a faded wall across the narrow street caught my eye. Definitely not Persian, I inferred that it must be Turkish written in its old script. Below it, a couple of old, rusted taps jutted out. This is all that now remains of what once must have been Turkish baths. Although the town boasts of a few interesting museums including, quite predictably for Greek towns, the Archaeological Museum, yet I avoided those to make my way from the Church of Aghios Spyridon through narrow streets past an imposing brick building in an alley just off the wide Syntagma Square. That building is the Bouleuterion, once a mosque in the Ottoman times, which housed the first Greek parliament in the 1820s and also served as the residence of Kapodistrias. The Syntagma Square itself is perhaps the liveliest part of the town with its myriad cafes, restaurants, vendors, musicians and jugglers. According to local lore, it is said to have been the meeting place of the Greek chieftains in those tumultuous days of the early 19th century when they probably thrashed out their strategies under a huge old plane tree. Another mosque from the Ottoman times, complete with its red-tiled domes and arches, and now used as a cultural centre, stands on one side of the Syntagma Square. It also served for some time as the palace of the Turkish governor. No visit to Nafplio is complete without a stroll past the invariably crowded cafes and fish tavernas that line the seaside just north of the Syntagma Square. I have found no other walk in Greece to be so peaceful and refreshing. History and modernity seem to meld as fresh air blows in from the Mediterranean ruffling the neat palm trees and spreading the sound of Greek music being played in Syntagma Square further. Came Partition. Habib migrated to Pakistan. In Lahore where his family settled, India was only a couple of kilometres away, Kapurthala a few more. But in the mind, in the consciousness of two hostile countries, it was an infinitely greater gap. Habib's friends, his tennis-playing days in Kapurthala, were lost to him -- seemingly, and sadly, forever. He joined the Pakistan Army, rose to Major, fought three wars against India. What must it have been for men like him? I wonder as he tells me all this. What must it have been to fight the country that nurtured you to manhood? Habib's soldierly duty to Pakistan did not translate, as so many might assume it would, into an automatic hatred of India. It just heightened his yearning for my country, a desire to see Kapurthala once more. The city in Indian Punjab retained its magnetism. The years went by. Visa applications were made and rejected. Habib retired from the Army and more visa applications were rejected. Growing old, he started to fear he might never see Kapurthala again. In the late 1990s, while visiting his children in the US, he ran into a nephew of Rattan Chand and they re-established contact. They wrote letters to each other and spoke on the phone, but it wasn't enough. Acutely conscious of the passage of time, both men were desperate to meet. How to cross the line? How to bridge that divide? Meanwhile, I met Major Habib's daughter Arifa, coincidentally, at a camp in the US for children from across lines of hostility. She and I had travelled there with teams of kids from Pakistan and India. "Seeds of Peace" -- seeds who must travel halfway around the globe to meet and learn about each other. Arifa and I became good friends. When she told me about her father and Rattan Chand, I fired off letters about their desire to meet in every direction I could think of. Habib meanwhile was again applying for an Indian visa. A few of my letters resulted in notes to officials at the Indian High Commission in Islamabad to consider Major Habib's case favourably. Encouraged, I made plans to travel north to meet the two old friends. In early October, the Commission told Habib he would get his visa. Elated, he called to let me know, reaching me in a poky hotel room near the Golden Temple in Amritsar. "My son has driven to Islamabad to pick up the visa," he said. It struck me that as we spoke I was physically closer to him than his son -- Amritsar being less than 50km from Lahore -- and yet what a chasm lay between us. What a formidable obstacle is this baggage of 62 years. The next morning, 85-year-old Major Habib and his son Abid crossed the border at Wagah. Waiting for them in a beige Tata Indigo was Rattan Chand's grandson Vikrant and me. No way was I going to miss this step across Partition. "I have been longing for this for 62 years!" he told us when we greeted him. We drove two hours to Kapurthala, Major Habib full of stories and memories. Vikrant dropped us off on the main road and we walked through a warren of narrow lanes to the heart of the jewellery market, Sarafaan bazaar, to a house that says on the door: "RC Ahluwalia 1926". In this sits Rattan Chand, and today is his 94th birthday. His present, knocking on his door, is his friend from a lifetime ago. Rattan Chand is a small man, and he nearly disappears in the bear hug he gets from the taller, heftier Major Habib. Only his hands are visible, on Habib's back. When we sit, both men's eyes are glistening with tears. There are long silences. How do you pick up the threads after six decades? How do you start catching up? Looking around as they struggle for words, I see a few stuffed animals -- there must be a child in this house -- and on the wall, a portrait of Rattan Chand from 1934, dressed in a blazer and jodhpurs, holding the reins of a handsome horse. Abid, capturing the reunion on video, urges the two men to speak: "After all these years, you must have plenty of memories to share!" Rattan Chand has one. It's about someone called Rakha Ram who always claimed he was a very good tennis player. One day, the Maharajah's tennis marker came to play with the gang. Rakha told everyone he was going to easily beat the marker. When Rattan and Habib looked in a half-hour later to see how Rakha was doing, they found the marker playing holle-holle -- slowly and gently -- with Rakha, patting the ball over the net so Rakha could keep up. Seeing them, a gasping Rakha pleaded for water. So much for the "very good" player. Habib and Rattan chuckle at the memory. It triggers more stories. Of two brothers whom everyone called Manni and Fanni -- the names set off more chuckles -- "Fanni went to America", says Rattan Chand. Going off to Amritsar for supplies with a ten-rupee note and returning with change. Of Habib coming to this very house for the mundan of a boy -- Rattan Chand's son, grandfather of the little girl who plays with stuffed animals. In this house there are memories. As we walk the warren there are memories. At the chowk once named for Habib's grandfather there are memories. Habib identifies the little junction by an old "pyau", a water-tap on a pedestal. "It was there in my time," he says, "but it had a different shape then." From where, I wonder silently, does a memory of a "pyau" spring? 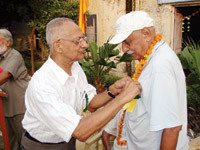 The local senior citizens' club has an evening function planned to celebrate Rattan Chand's birthday. With Major Habib's presence, it's a doubly special occasion. Member after member comes up to garland them, gift them shawls ("tokens of our love"), greet them with respect and affection. I'm watching with an odd fascination: when will the hatred for the enemy country surface, directed at this soldier from there? The answer only shows up my cynicism. There is no hatred. There is instead an outpouring -- for once, the clichéd word fits -- of curiosity and emotion and warmth. Someone recites several couplets he has composed for this moment, rhyming "Habib" with "karib". Someone sings. Someone speaks of his feelings, his memories. Someone else sings more, into the dusk. It's nearly dark when Major Habib rises to speak. He tells his story, and talks of the "laxman rekha" between India and Pakistan. Then he says: "I could travel all over the world. But I could not come to my home. I've tried to cross this laxman rekha for years, without success. I'm so happy that I've finally crossed it today, on my friend's 94th birthday." We spend half an hour in the Major's old family house, a few metres down the road from the pyau. A man now owns it is dressed in a spotless white kurta. He insists we come in and someone produces Limcas. A clutch of young men crowds the door, listening intently to Habib. At one point, his son Abid speaks of when he was their age. Growing up in Pakistan, especially as the son of a soldier, he had one desire and one desire only: join the Army, fight and defeat India. "Then," he says, "I met some Indians who had come for a visit and I realized how foolish that was." When we rise to leave, the young men flock to touch the Major's feet. Some laxman rekhas must be crossed. Holle-holle maybe, but crossed nevertheless.